The Grace Note is the most common and simplest form of ornament in the sub-category of the grace embellishments. In a sense, the grace note is also a general name for a group of different types of grace embellishments which use the grace note’s form as its’ basis. More specifically, the smooth grace embellishments include the following ornaments; the grace note itself, the appoggiatura, the acciaccatura, the mordent and the slide ornaments. The designs, principals and concepts presented in this article, in many instances, also apply to the various smooth grace ornaments used in music notation. The grace note is sometimes referred to as a leaning note in so far as when the grace note is performed it sounds as though it is leaning (sonically) in the direction of its associated principal or resolving note. Also, the word grace suggest that grace notes should be performed in an elegant and fluid fashion rather than playing them in an abrupt or rigid manner. The idea is rather easy to understand and as a performer, with a little practice you can easily perfect playing them. I should add that some artists/performers do play them rather harshly, stressing the ornament and its associated principal note with the intent to gain a noticeable impact on their listeners. Used in these ways the grace note offers a variety of effects and influences applicable to the melody of the composition. The grace note ornament, when placed and performed properly, increases the emotional impact of the music on the audience. Further, the use of the grace note adds beauty and depth to the melody. The different designs of the marks and symbols used in the smooth graces offer the variety of the grace note’s symbolic options which are based upon those presented in the chart above. We begin with the basics and build from there, first identifying the descriptive names of the notes, marks and symbols which are used in association with the smooth grace ornaments through to a very cool look at some wave files of the grace note. The names applied to the grace note are used and referenced throughout this presentation and in several additional articles within this mini-series, so, it is important to learn their meaning and to use them appropriately. The chart above shows a size comparison of the grace note to the size of its principal note and as compared to a normal sized eighth note. The miniature size helps the performer to know they should be played differently than standard note shapes of the standard size, as will be presented below. Also, it does make it easier to notice the ornament more as it clearly stands out as different than the normal sized note. 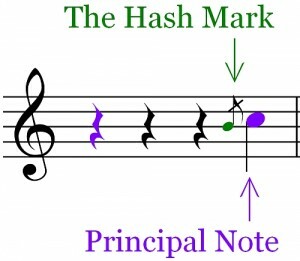 Principal Note – The quarter note in the chart above is a full size note and shaped as per standard or conventional notation practice (with the exception of color). For descriptive purposes this note is called the principal note when used in conjunction with a grace note, the smaller black note. Also, the principal note is an integral part of the melody, without it the melody would not stand as intended. In a very simplistic and descriptive sense, a melody is made up of two or more notes that sound pleasing to the ear. Each note of an unadorned melody or a simple melody is called a principal note. A short series of principal notes are collectively referred to as a motif, a basic melodic idea. A longer series of principal notes is called a melodic phrase which is an extension of the motif and which can stand on its own. It has a well defined beginning and ending point and it is not the entire melody line. Lastly, the full melody within a composition is referred to as simply the melody or melodic line of a musical work. There are different ways to embellish or ornament a melody. 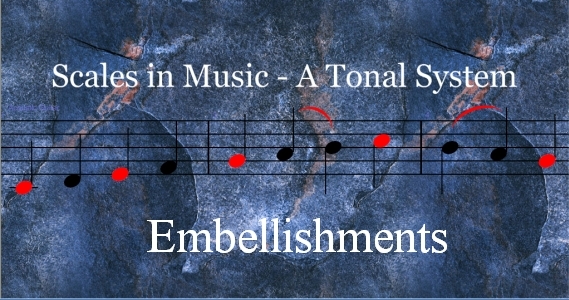 The use of the various embellishments and the specific ornaments allows a composer to alter the melody by adding to or adorning melodic ideas through the use of the ornaments. As defined in this article, the use of the grace note is one of the ways to accomplish this. When applied properly, all grace notes are associated to a single principal note. Should you decide to ornament more than one principal note within a melody, each principal note requires its own grace note. In some cases, some of ornaments can influence multiple principal notes however, as a general rule each principal note you wish to be ornamented should have its own grace note and marked as such. Auxiliary Note – The miniature auxiliary note is shown in this chart as an eighth note. It is also the actual grace note in this example. The grace note when performed leans in the direction of the principal note as mentioned above. Its function is to adorn or embellish the melody as we have been presenting thus far. An interval is the “space” between two notes of a different pitch. 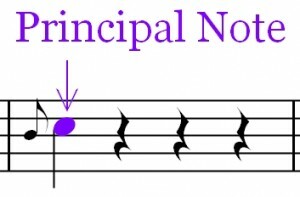 The auxiliary note’s pitch can be either an interval above or below the staff location of the principal note’s pitch. Grace notes are to be performed either moving up or down based upon their actual pitch and relative to the pitch of its principal note, as this next chart illustrates. In measure one the movement begins on the grace note, shown with a pitch of B and ends on its principal note, shown with a pitch of C. This type of movement is referred to as an ascending movement. The second measure reflects the opposite type of movement, the descending movement, where the grace note of D and its movement is down to its principal C note. All other comments previously made about the principal and the auxiliary notes apply to both the ascending and descending movement. This is important to know as the physical distance between the notes, called an interval, influences to a degree how the grace notes are physically performed. 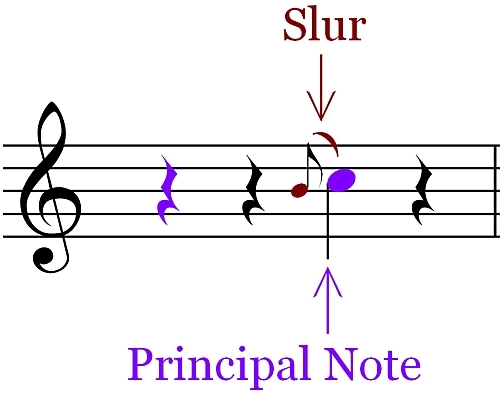 The Slur – Shown in brown and on beat three of the measure, the slur, is often used to join together the auxiliary note and its principal note. 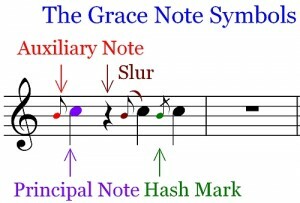 The slur itself is also smaller than the normal sized slur symbol and its size is in proportion to that of the grace note. Notice that the grace note and the primary note are not the same pitch, B and C. The slur is commonly used to tie together notes of a different pitch via this unique notation mark. It is not proper to use a tie symbol simply due to the fact that the tie is used for notes of the same pitch. Consequently, the use of the slur symbol is the proper notation mark, again, for notes of a different pitch. Also, the slur suggests a smooth transition between the notes involved. 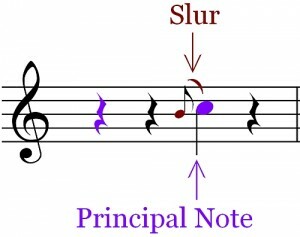 When using a slur, both the auxiliary note and the principal note are played or sounded. Below is an audio clip of how both notes should be recognizable when performing them. Only one grace note and its principal is in the sound clip to avoid any confusion about this point. You are free to play it as many times as is necessary for you to clearly hear each note as it sounds and the smooth transition between them. 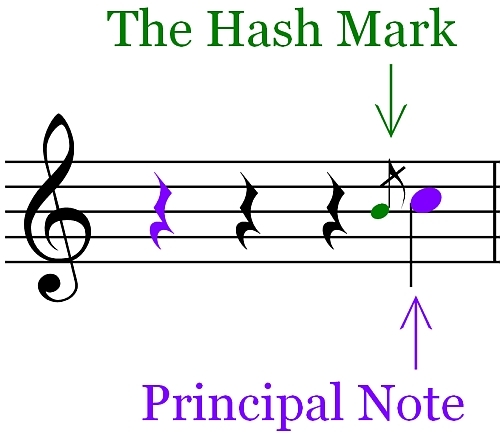 The Hash Mark – The grace note symbol used on beat four is also miniature in size and it has an additional hash mark bisecting both the flag and the stem of the regular grace note. The hash mark is at a 45 degree angle with its lowest end on the left and its highest end on the right. This is another option for the grace note as will be discussed further in the presentation on the acciaccatura ornament. I also want to point out that the slur and the hash mark can be used together however it is important to be tidy and that each symbol is clear when doing so. When describing the simple grace note, it is important to point out that the principal note is the note which ends the grace activity or movement, filling the total duration of a beat within a measure of music. The number of beats and the note shape needed to fill one beat within a measure of music is determined by the time signature. In 4/4 time, there are four beats in a measure and a quarter note gets one beat, for example. The duration of a beat is determined by the tempo set for the music. Tempo is time related and the tempo rate is assigned to music by the composer. The tempo rate is measured in beats per minute. Following our example of the 4/4 time signature, if a tempo of 120 beats per minute is chosen, the four quarter notes are performed at the same rate as if there were 120 quarter notes in a single measure of music. The 4/4 time signature specifically designates that there are only four beats in a measure. With a designated tempo of 120 bpm, the speed or rate at which the four quarter notes are performed is thus established. The auxiliary note embellishes or ornaments its principal note. Also, the grace note gets its time from the principal note’s duration or time value, which is determined by its shape and the tempo of the music. In our examples, the principal note is shown as a quarter note which normally fills the timing of the beat. When a grace note is applied to the principal note they share the timing of the relative beat. In this way both the auxiliary note and the principal note are played on the same beat. The number of beats within the measure does not change and the timing or tempo of the beats is not altered either. The main point is the following. 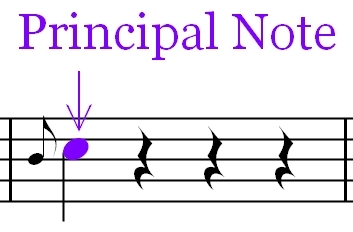 The principal note’s duration is divided between the auxiliary note and the principal note. The grace note gets only a fraction of a beat and the remaining fraction of the same beat is allocated to the principal note. Its actual duration is determined by both tempo and note shape. Also, a grace note’s duration is somewhat flexible. Depending upon the ornament type and which type of grace note is in use. The fraction of the beat assigned to it can be determined either at the discretion of the performer, if rhythmically correct, or as determined and written into the score by the composer. If designated by the composer, then the simple grace note’s duration is to be performed as written and still, its duration is relative to the type of grace note in use and the choices made by the performer, if given an artistic license to do so. Some of the grace ornaments are made up of more than one grace note. In these cases, the number of notes appearing in the ornament alters both the note shape used for the included notes but the duration of the embellishment is not changed. Collectively all of the grace notes in these types of ornaments are played sharing the total beat duration with their relative principal note. An example would be the acciaccatura. This idea will be explored further in our presentation on the acciaccatura grace ornament. If left unmarked, the grace note and its duration remains a non-specified fraction of the beat and of no predetermined duration other than the fact that it shares the same beat and timing with its principal note. To a degree the grace note is flexible and subject to personal and/or performance preferences. Some additional distinctions need to be made. 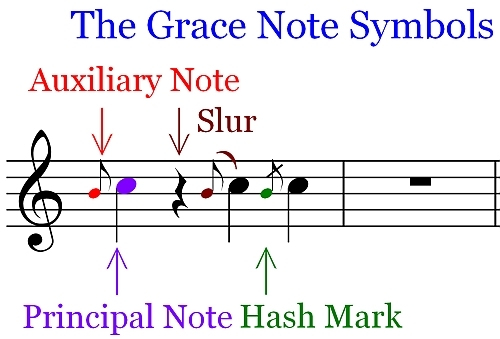 It is important to clarify more about the grace note and its use. The necessity to somehow demonstrate that the grace note anticipates the beat and that it shares the beat’s timing with its principal note was part of the reason to develop the miniature size of the grace note as well as its placement, before the principal note, which lays on the beat. In the chart above, the green numbers below the staff represent the beats in each measure. Notice that the grace note in measure one does not lay directly on the first beat of the first measure. In this way the performance of the grace note occurs just prior to the beat rather than on the beat. Measure one demonstrates the proper placement of the simple grace note in relation to its principal note. This placement also suggests the anticipation of the beat. Keep in mind however, that the grace note and the principal note are performed within the same beat as discussed above. With regard to music notation, the distinction of the grace note (sharing the beat with its principal) is falsely demonstrated in measure two in the chart above. If written in this fashion, measure two does not show the proper use of the grace note at all rather it is two eighth notes as seen in normal or standard music notation. Even though the notes in measure two use the same note shape, an eighth note, and that they are placed within the same beat, measure two is not equivalent to measure one. For additional clarity, also notice that the principal note is placed on the beat in measure one however, in measure two the principal note occurs after the beat, in fact half way through the beat. The grace note (B) is placed on the first beat in measure two which does not demonstrate an anticipation of the beat. This is another important distinction when using the grace note. Let’s listen to the difference in these two measures paying close attention to how the grace note anticipates the beat for the first measure as compared to the notes in the second. It’s OK to replay the mp3 clip repeatedly, in fact, I would urge that you do so you can thoroughly understand the grace note as used in measure one as compared to the notation in measure two. As a conclusion to this point when describing grace notes, we can see now how the notes used in measure one and those used in measure two are not equivalent in reference to how the grace note shares the beat and to a degree, how it is performed. In total, we have made four significant distinctions in so far as grace notes are concerned. These four important distinctions are; the size of the grace note is smaller than the normal sized note of the same shape, the grace note shares the duration of the beat with its principal note, the grace note is performed in anticipation of the beat and the proper placement of the grace note is to the left of its principal note, so far that is. We remain in alignment with the embellishment’s foundation and guidelines. To get a better understanding (aurally), the following chart is shown along with its related mp3 clip. This time we have properly placed the grace note and we have added a full compliment of C quarter notes within both measures. This should assist you in hearing the grace/principal note combination as well as the overall rhythmic structure which resides within the two measures. The mp3 clip below will help you to gain additional auditory recognition that is needed to fully appreciate the grace note. The mp3 is a recording of a piano performing the grace and quarter notes as demonstrated in the chart above. The mp3 clip is an exact audio representation as the notation in the chart above. Hopefully this exercise will assist you in learning how the grace note shares the beat with its principal note. Also, notice that the rhythmic structure does not change so this is another distinction to make when listening to the mp3 clip. Instructions – First review the two measures visually. Then with your eyes closed, internally visualize the two measures. Once you have visualized the them play the mp3 repeatedly until you hear the beats and how the grace note influences the timing of the principal note. Again, pay extra attention to the fact that both the auxiliary note and the principal note are played within the timing of the first beat of each measure. If you have a little trouble tap or count out the rhythm as you listen to the mp3 clip. Further, some additional distinctions need to be made to more fully understand the grace note and its use. First and foremost notice in the chart above, that the shape of the grace note is an eighth note. The eighth note is exactly ½ the duration of a quarter note, a ½:1 ratio. This is the eighth note’s relationship to the quarter note. Other ratios can be used and we will present this information in an upcoming article. For now, please make a mental note of this point. Comment – To deter those of you who may misunderstand the idea of reversing the ratio, a 2:1 relationship is an incorrect perspective and conclusion. That is, it is proper to base the ratio of the grace note and its respective note shape to its principal rather than the other way around. So, the use of any simple grace note follows the ½:1 (grace to principal) relationship. This is the accepted practice. To complete this thought, the use of a principal note with the duration of a half note uses the quarter note as its grace note, a sixteenth note uses the 32nd note when creating an applicable grace note, etc. There are exceptions to this rule especially when defining other grace note types. It was stated in the Embellishments – Foundation and Guidelines article that each principal note has four auxiliary notes. The chart below demonstrates this idea. Background Information – The following information takes into account that the smallest interval between two adjacent notes is the half step. Secondly, two half steps equal a whole step. A sharp raises a note’s pitch by one half step. 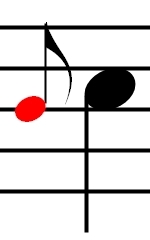 The flat symbol lowers the pitch of the note by a half step. These four points are necessary to know in order to more fully understand the use of the grace note as related to its principal note. Again, these relationships are important so if need be please reread this paragraph. It will be of help as you continue forward. Note: We will be discussing intervals in an upcoming article series which will completely explain what intervals are and how to use them. Do, however, pay close attention to the descriptions below as related to intervals. This information will be important and included in our presentation for the appoggiatura ornament. The First Auxiliary Note – In brief and in step with the chart above, the reference scale is C major. The first beat includes a principal note (a quarter note) with a pitch of C and a grace note (an eighth note) with a pitch of Bb. The affect of applying the flat symbol to the diatonic note of B has lowered the pitch from a B to a Bb, by a one half step interval. 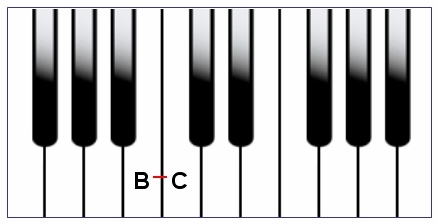 Normally, the pitch of B is exactly one half step below the pitch of its principal, the C note in the C major scale. Due to the use of the flat symbol the relationship to the principal note has been changed. 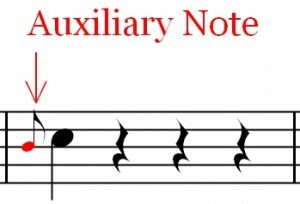 The auxiliary note has become a Bb and it has become a non-diatonic note and it is also now a whole step down from the primary note’s pitch of C. This is the first grace note type of the four primary auxiliary notes. 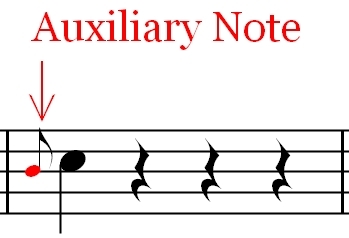 The Second Auxiliary Note – The auxiliary B note is a diatonic interval away from its principal note. Meaning the notes involved are within the C Major scale and it is exactly a one half step interval below its principal note of C.
The Third Auxiliary Note – In this example the miniature or auxiliary C note includes a sharp symbol altering its pitch from C to C#, a non-diatonic note. The C# is not in the C major scale and it becomes a non-diatonic note when the sharp symbol is added to it. It is also a half step above its principal note of C.
The Fourth Auxiliary Note – Finally, the D auxiliary note is exactly one whole step away from the principal note of C.
I do want to mention at this point that in the C major scale, the interval between the B and C is formally called a minor second interval and the interval between C and D is called a major second interval. More on this later in our overall Scales in Music article series. This is the concept behind the underlying point that all principal notes have four auxiliary notes. The importance of this will be demonstrated when presenting other smooth grace notes, specifically the appoggiatura, the acciaccatura and the mordent, all of these embellishments are smooth grace ornaments. The four auxiliary notes are available options to choose from when composing music. There may be the occasion when a composer desires to place an emphasis or an accent on a principal note within a melody. Typically, one would think that either the grace note or the principal note can be accented or stressed, in which case the following will be helpful in making this distinction. The term accent simply means to place an emphasis on a given note or notes within a melody. The accent is therefore another music notation tool, a symbol, used for purposes of directing the performer to add a small amount of added stress on a beat or on multiple beats within a measure of music. When beats in a measure are accented, this is sometimes referred to as the pulse within a measure. When using the grace note, the accent is placed on the principal note rather than on the grace note itself. In practice, a beat or beats within a measure of music are accented to create a certain “feel” or rhythmic pulse recognizable within the flow of music. The accent, to a degree, influences the intensity or loudness of the note marked by the accent symbol. This is how we recognize rock-n-roll music where the second and fourth beats are accented, for example. Let’s take a look at how the principal note is marked and thereby accented, affecting an added stress on a given beat within a measure. In measure one the principal note is accented by the use of the “greater than” symbol, marked in red above the staff. The symbol is placed over the note you wish to be accented. The accent symbol can be placed on any principal melody note within a measure however it is a matter of placing the accent based on a decision which is relative to musical style, taste and purpose. The notes without the accent are played normally when unmarked or unaccented. No additional stress is placed on them. In measure two the accent is placed on the auxiliary or grace note rather than on the principal note. When used in the grace ornaments the accent symbol is reduced in size in a suitable size match to that of the grace note. 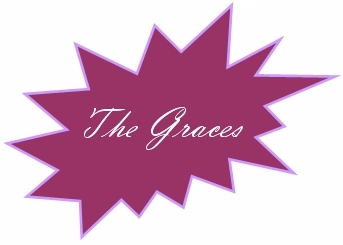 Relative to the type of grace note in use an accent can be placed on a grace note if it is necessary to stress a specific note in a series of notes which make up the ornament. Some composers will place an accent above a grace note for affect however this is not the accepted practice when using the simple grace note. The convention is to place the accent on the principal note as shown in measure one. Let’s look at this idea in a very different way. The graph below is a wave form demonstrating the accent as applied to two of the eight consecutive quarter notes with a pitch of C. The idea behind accenting notes can be easily understood using a visual representation of the idea. Take notice of the differences in size and shape between the first pulse or beat within the 8-note pattern as compared to the next three pulses. The first of these is somewhat larger than the following three. The first pulse (or beat) is accented versus the following three which are not. The same set of pulses is repeated at the fifth pulse, an accented beat, followed by three pulses which are not accented. Also, each beat is consistent as to length (from peak to peak) across all beats, even those that are accented. This is significant because each peak is in alignment with each beat within the measure unless a rest is used. In this case there is nothing to accent and a flat line would appear in the graph in between the playable notes. There is however a difference in the physical appearance of beats one and five as compared to the rest of the beats. Beats one and five have an auxiliary or grace note applied to them. Let’s look a little closer at this idea. Two beats or pulses are shown in the graph. Time is represented from left to right. Loudness or intensity is represented from top to bottom where the bottom is the center line seen on the far left. The closer to the center line, the lower the intensity or loudness. 1. The first part of beat one, shaded in grey, is the auxiliary or the grace note. The second part of beat one is its principal note. Notice how the grace and principal notes share the first beat. 2. Notice that the auxiliary note does not reach as high above the center line as its principal note. The principal note is then slightly louder than the grace note. In other words, the principal note is accented and the grace note is not. 3. Notice how the loudness of the auxiliary note gets a little quieter (in small steps (within its short duration) just before the principal note sounds. Also, notice how the principal note does the same but over an extended time period. These shapes in general are what a diminuendo looks like graphically. Accenting Beats – One more important point about the 8-note graph. On beat one and beat five the graphic for the beat is physically larger in all dimensions than the others. In this regard, any beat you wish accented can be. This is accomplished in music notation be placing an accent symbol over the notes on one or more beats within the measure. This can be advantageous and useful to gain a specific accent on any beat of your choosing, when you are the composer, that is. As one would guess, accenting is useful in music composition and when working with wave forms while adjusting intensities during the mastering process. Comment: By using a different method of presentation sometimes learning is made easier. I hope you found this chart and the included information to be significantly better at describing both the placement of the grace note as well as the concept of accenting notes or grace notes. We will have more comments about using the accent in other more extended grace ornament descriptions in upcoming articles in this min-series as well as in other articles planned, such as the topic of rhythm. The following section compares playing the auxiliary note of B as a grace note leaning against the principal note of C on the piano and on the guitar. On a keyboard the movement can be created by playing the B and C notes using two fingers and playing the notes one immediately after the other, within the timing of a single beat. More advanced performers play them using a sliding motion from left to right where one finger strikes the grace or auxiliary note (B) and slides their finger to the adjacent primary note (C) causing it to sound. Performance of the grace note is easily heard on the first beat of each measure during playback of the following mp3. Similarly, on stringed instruments the grace note (B), shown in the guitar fretboard above, is played by sliding (the red line) the finger tip from one position or fret to the next, in this case up the fretboard from left to right. The performer slides their finger from the B to the C note positions within the timing of the applicable beat. Again, the movement of the performer’s fingers is from left to right. Another method of performing the grace note on stringed instruments is to use two fingers thus playing the B note using the index finger (i) and the C note is played using the middle finger (m), similar to playing them on the piano. Again, the notes are played smoothly one followed immediately by the other within the applicable beat. This method of playing on the guitar is sometimes referred to as using the “hammer on” performance technique especially when an increased force is behind the placement of the second finger for sounding the applicable principal note. All stringed instruments perform the smooth grace in a relatively similar manner. The guitar fretboard has a number of strings and a number of frets which opens up a wide range of possibilities when using the smooth grace. Likewise, there are 108 keys on a full size piano again offering many possibilities for the use of the grace note for this instrument. A lot of information was presented in this article about the grace note. The importance of making minor yet important notation distinctions becomes obvious when comparing them (in notation) as well as by listening to them via audio clips. The size and shape of the grace note as well as the placement of it, both on the musical staff and in relation to its principal note are the basic ideas whereas the performance of the grace note is an all together different perspective which offers a deeper understanding of the grace note than you would otherwise achieve. The six main points made in this article are; the grace note is smaller than the standard sized note, the grace note shares the duration of the beat with its principal note, the grace note is performed in anticipation of the beat, the proper placement of the grace note is to the left of its principal note, the accent is primarily on the principal note when using the simple grace note and finally, there are four auxiliary notes which can be used as grace notes for its related principal note. The grace note and the information presented herein, represents the general use of the smooth grace ornaments including the grace notes when used in the appoggiatura and the acciaccatura, smooth grace ornaments. This concludes our presentation on the grace note. There are different types of grace embellishments used in music notation which follow and advance the practices as applied to the grace note. Of great importance is the appoggiatura smooth grace ornament. Next up is our presentation about this ornament which is described in detail. The article is titled the Embellishments – The Appoggiatura – Part 24g.